Given the slogan I can cope with the fact that it actually doesn’t cover my bum and sort of sits on the widest part of my hips. It’s cotton but not really heavy and it is comfy. That did mean that my wobbly thighs were on full view – sorry about that people of Riddlesden. Kath has bought Runner’s World magazine on and off for as long as I can remember really and I’ve never so much as glanced at them until recently. Now there is a magazine that isn’t for me – pictures of fit skinny people in lycra and features on how to run yor fasted 10km ever… Urgh. Then there was the issue ages and ages ago which had a recipe for Courgette/Chocolate buns in – hm maybe it is worth a look after all. No, that recipe was pretty much it. In a rather classic work avoidance moment the other day I picked up 3 past issues and started flicking through them and today I sprawled out in the sun with the latest issue . Some of it is quite interesting actually – the science stuff appeals to me. What is clear though is that so much advice about running is contradictory. One expert says one thing, another the exact opposite. Sometimes the Dos are the Dos and sometimes they’re the Don’ts and vice versa. Runners agree on very little other than their love of running. There were some things, some basics if you like, that people did seem to agree on: Regular running is good for you, Eating right is important particularly for long distance runners (but no agreement on what ‘right’ is), rest is also important (how much, when etc – no agreement) and running is the best thing ever. Well I accept the first – science shows me that, the second is also sensible and must partly be about what works for you, the third I can wholeheartedly embrace – rest is awesome, the fourth I have issues with. I do not love running, it is not the best thing ever, I do not feel free, happy or whatever when running (mostly I feel like there’s still a bloody long way to go or I’ve already gone a bloody long way and must be nearly there). That proves that then – I am really not a runner! 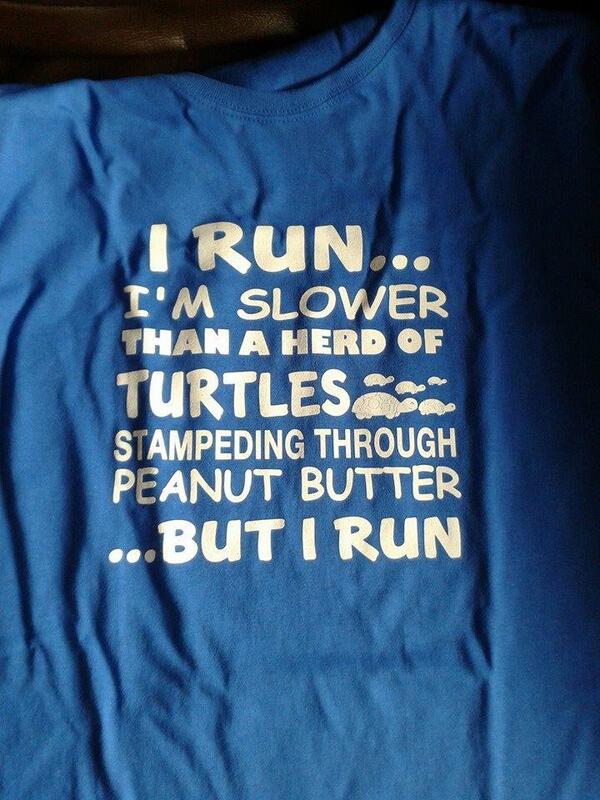 When I started running, I had this cotton t-shirt I loved to wear. It’s funny how it was after all of that when all the sports fabrics got popular. My cotton t never gave me any trouble! Way to get in your run! I went the same distance today!